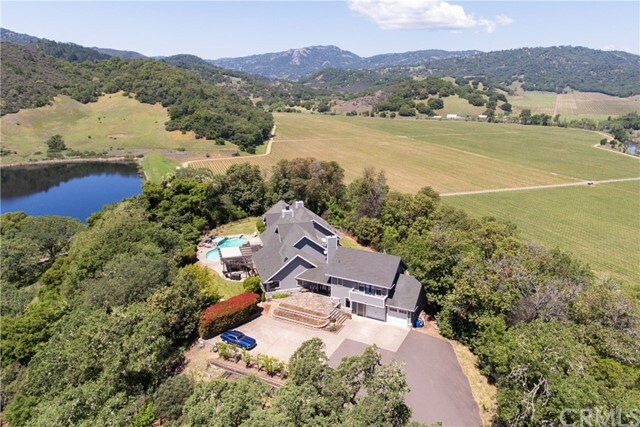 All Hopland homes currently listed for sale in Hopland as of 04/23/2019 are shown below. You can change the search criteria at any time by pressing the 'Change Search' button below. If you have any questions or you would like more information about any Hopland homes for sale or other Hopland real estate, please contact us and one of our knowledgeable Hopland REALTORS® would be pleased to assist you. "Stunning Custom Home on over 18 acres in private Hopland location! Wonderful mountain, valley and vineyard views! 4554 square feet, 4 bedrooms, 6 bathrooms, 669 sq. ft. garage with brand new garage doors. In-ground swimming pool with hot tub, incl. remote operated waterfalls, lighting. Entertain your guests day and night in the large, level back yard complete with covered patio and lawn areas. Interior of home features great open living space! Living room has hardwood floors, 26' Douglas Fir vaulted ceiling, custom rock wall fireplace, built in entertainment center and wood cased french doors leading to back yard. Spacious dining area leads you into the gourmet kitchen featuring granite counters, custom cherry cabinets, pot filler faucet over 6 burner gas range with griddle, Viking convection ovens, bakers station and large walk-in pantry. Beautiful main master suite with fireplace, doug fir vaulted ceiling, french door access to pool / yard. Dreamy master bathroom has limestone flooring, marble shower and marble surround soaking tub plus large walk in closet with built in storage / drawers. Cinema Room fully equipped with projector, movie screen and theater seating to have the ultimate in home movie experience! Kitchenette nearby for your drinks and snacks! Other features; guest master bedroom, library, office, interior laundry room, mud room, ample attic space with pull down ladder - potential to finish for addl. living space. This beautiful custom home is truly a must see!"